Human beings are naturally inclined to find patterns even where there are none. This phenomenon is called Apophenia. For this reason, we see animals in the stars and shapes in the Moon. 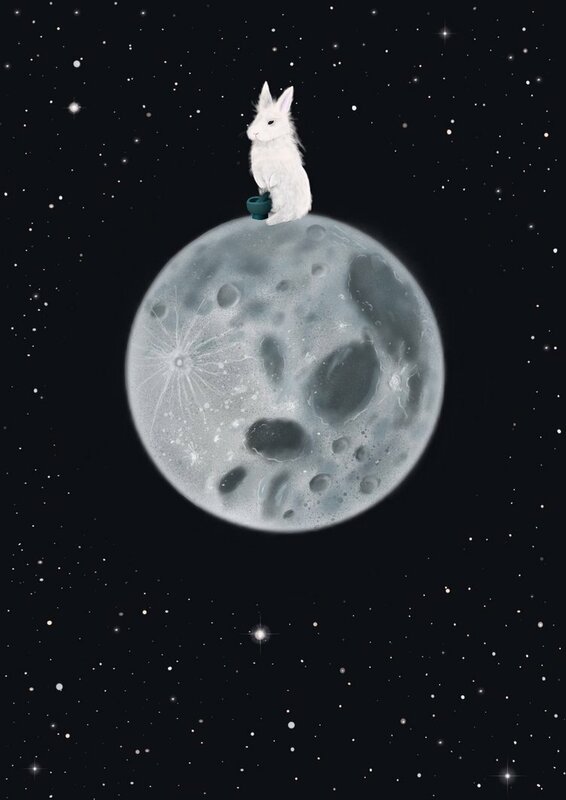 While it is common to view a man in the Moon in Western Civilization the rabbit is also commonly viewed in the Moon in many cultures around the world. There are many stories about how a rabbit’s image became imprinted on the moon. This last month or so I have painted several scenes relating to or inspired by the myths I am aware of. Monkey, Otter, Jackal, and Rabbit pledge to practice charity on the Buddhist day of observance. The animals came across an old beggar who was staving. Monkey offered fruits from the trees, Otter gave fish, and Jackal brought a stolen pot of milk curd. While rabbit seeing he could only gather grass a food not fit for humans tossed himself on the fire sacrificing himself to save the old man. The old man was actually a Buddhist God Sakra (sometimes Emperor of the Heavens) who honored rabbit by placing him on the moon. You can still see the rabbit draped in smoke on the moon to this day. This is a popular myth in Asia with versions found in China, Japan, Vietnam, and Korea. In some Asian myths, Rabbit is pounding the Elixir of Life or rice. Thus my inclusion of a mortar in some of the images. Interestingly there is very similar Mayan myth where Rabbit offers himself to the disguised Quetzalcoatl. In other Meso American myths, a god’s life was required to create the sun. The humble Nanahuatzin readily sacrificed himself to the flames. But, the wealthy Tecciztecatl hesitated and only entered the flames after feeling shamed by Nanahautzin’s sacrifice. The Gods place a Rabbit on the face of Tecciztecatl to diminish his light as punishment and he became the Moon. 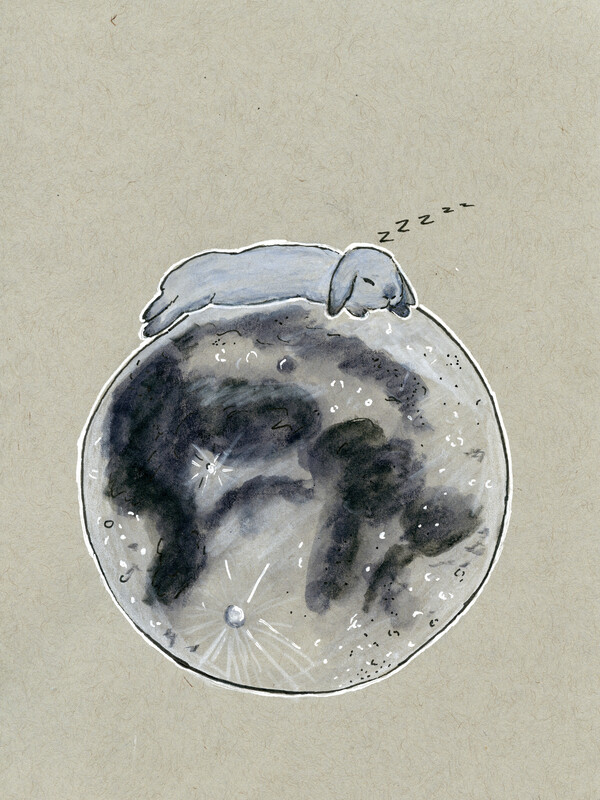 The rabbit in the Moon is sometimes seen as a companion animal to a specific diety that is thought to inhabit the Moon. In China, this is the lovely Chang’e who rose to the heavens after consuming all of the elixir of life which was meant to be shared with her husband Yi. There are many versions of this story. In some versions, Yi had received this elixir as a reward for shooting down the extra suns which caused hardship drought. Or he may have been banished from heaven for killing the extra suns that were actually the Emperor of Heaven’s sons transformed and the elixir was meant to act as a get out of jail free card of sorts. Yi who loved his wife wished to spend eternity with her and gave it to her for safekeeping. In some versions, she drank the elixir purely out of excitement in others she did it to prevent her husband’s enemy from consuming it. The Jade rabbit became her companion and pounds new elixir of life for her on the Moon. 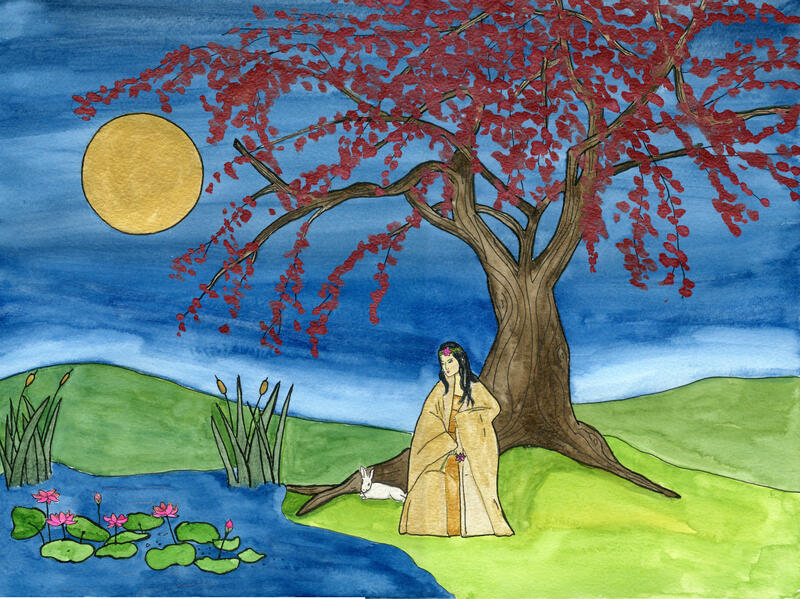 Chang’e is associated MidAutomn festival but I have painted a Moon Princess in the Spring as that is the time of year where I am now. The Moon Rabbit and Lady enjoy the cherry blossoms. Ink and watercolor. 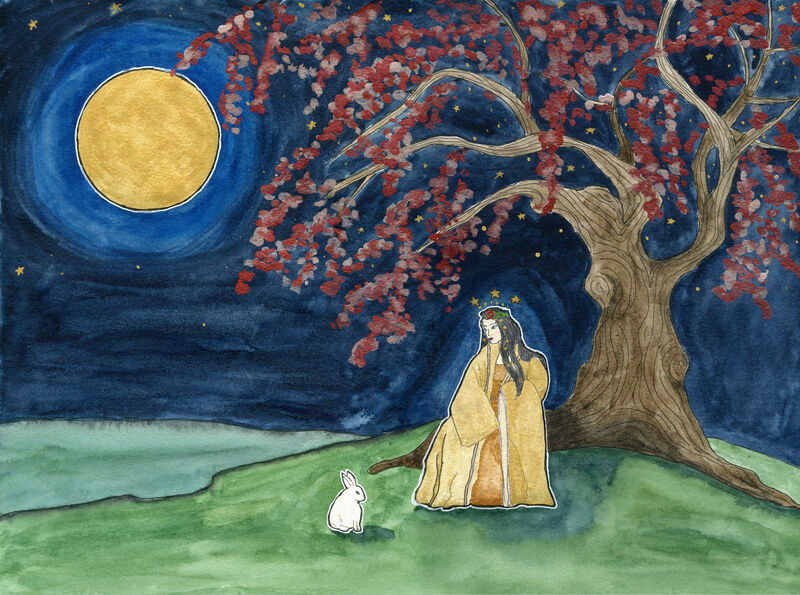 The Moon Princess and Rabbit enjoy Spring. 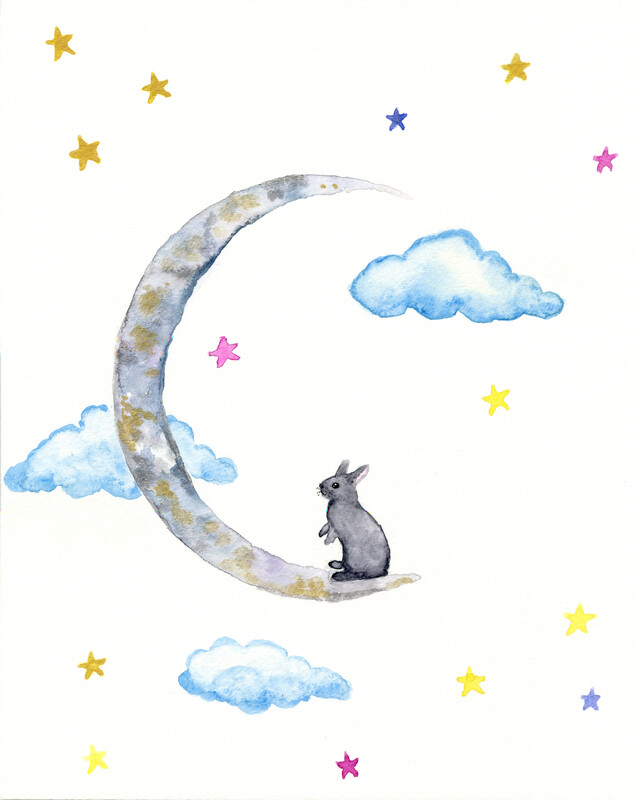 In a Cree legend, Rabbit desired to ride the moon. This myth is a bit different from other indigenous American myths as he is not fulfilling his typical role as a trickster. This is a rather straightforward story for Rabbit folklore. Only Crane was strong enough and willing to try the difficult journey. So rabbit held Crane’s legs as they flew to the Moon. This is why Crane’s legs are so long they were stretched out by Rabbit’s weight pulling on them. Durning the long trip Rabbit’s paws began to bleed from the strain of holding on to Crane. When they landed Rabbit touched Crane’s head he and his descendants have had a red mark there ever since. These are just a few of the Rabbit in the Moon myths I am aware of. There are more I am aware of that I have not had a chance to paint yet such as the Mayan Grandmother Moon and her Rabbit companion. Do you have a favorite Moon myth? If so please share it in the comments. The rabbit in the moon is based on an illustration from Journey to the West. https://www.roningallery.com/education/a-closer-look-jade-rabbit-and-sun-wukong/ I tried to write the charters for Jade Rabbit to the best of my ability but I am not all that knowledgeable on the topic of Chinese calligraphy so if anyone notices a slip up please let me know. 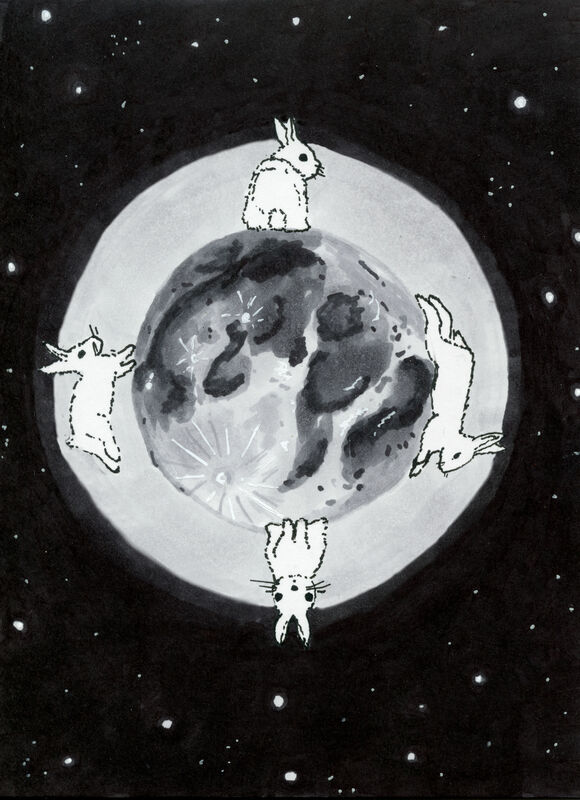 Rabbits view the Moon Rabbit and Lepus Constellation form Earth. Ink and Watercolor. I love your art! Fun idea to go so in-depth with ‘the man in the moon’ (or I should say, the rabbit in the moon). I never could see the rabbit, until I went closer to the equator and the moon looked completely different!